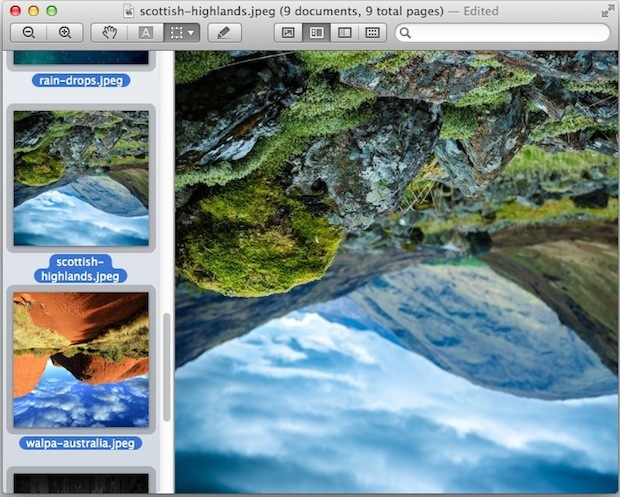 If you have a group of pictures which are orientated incorrectly that you need rotated either clockwise or counterclockwise, you can do that in Mac OS X without any third party apps. Bulk rotation of images can be accomplished quickly with the help of the bundled Preview app, we’ll show you how to use the app for this purpose with almost any group of compatible image files in a variety of formats, be it a group of JPG’s, GIF, PNG, TIFF, or anything else that can be opened in the Preview application. When satisfied with the orientation, just hit Command+S to save the image orientation changes across the board to all image files – that’s it! This assumes your default image editor is set to Preview. If not, you just need to launch Preview separately, and then drag the group of images you wish to rotate in bulk into the Preview Dock icon to perform the same task. This is undoubtedly the fastest way to batch rotate a variety of images of nearly any format at the same time in OS X, perhaps with the exception of the sips command line image modifier tool in Mac OS X, which can also perform image modifications from the terminal. Because the Terminal sips tool is command line based however, it’s generally reserved for more advanced use. Of course, sips and Preview can also be used to modify rotation or flip the orientation vertically or horizontally of a single picture file at a time as well. Preview is a fairly powerful app that is often underutilized for batch photo processing tasks, I use it frequently to batch rotate as described here, and also to batch resize images and perform bulk image file format conversions on groups of picture files for wallpaper posts and other purposes, making it an extremely valuable tool that is bundled with every Mac since the very earliest days of OS X. Preview is quick, lightweight, and much less demanding on resources than Photoshop or other heavier image editing apps for such tasks, you can be in and out of the app with your group modifications in just a few seconds. Happy image editing! This is stupid. Why are there five steps to rotate a simple picture?? Why cant I just click on the thumbnail and rotate the image? Mac can be so damn frustrating at times!! This worked for me, but according to the information in my finder, all of the images were reduced in size by roughly 2/3. They went from approximately 3mb to 900kb. Why is this happening? I rotate about 500 pics in a batch, after that was done. 99% of them are corrupted and I lost all of them. The file “G0034552.JPG” could not be opened. It may be damaged or use a file format that Preview doesn’t recognize. Command S doesn’t seem to help. I’m asked if I want to save or abandon the change to EACH file. I just clicked yes 85 times (having to wait for the save between). What the heck didn’t work?